Who should you turn to…to provide your residents and guests with engaging interactive entertainment that is Exciting and Fun? Amazing Magic and Hilarious Comedy! My name is Paul Dalholt, a.k.a. 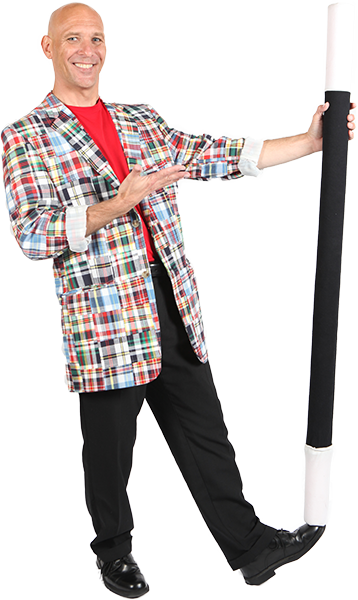 Presto Paul, and together with my wife and assistant Robin, we bring over 20 years of experience to the stage with an Amazing Magic Show full of Laughs, Music and Fun for all ages. We have created special programs specifically for senior centers. THE GOLDEN AGE OF MAGIC! The goal of these programs is to bring live theatre in the form of magic to seniors. The programs also strive to actively engage seniors and to empower them by giving them the ability to invite their family and friends to a special event. Additionally, it is designed to bridge and connect generations by offering group activities that everyone can participate in, enjoy and most importantly, talk about for weeks, months and even years to come. Our shows involve audience participation and remove the traditional “fourth wall” of theatre. This style of show promotes a different kind of personality and vitality, as opposed to other forms of entertainment offered to facilities like yours. What is involved in our Golden Age Of Magic Programs? Your residents will Experience Magic Like Never Before in an action packed 45 minute interactive magic show suitable for a variety of age ranges. Through a very unique combination of classical magic and modern mysteries, audiences are captivated from the moment Presto Paul steps out on stage with Amazing Magic and Hilarious Comedy! By weaving comedy throughout the performance Presto Paul will keep the crowd laughing and guessing what will happen next. This is a great intergenerational opportunity to invite friends, families or even neighboring day cares and schools to share in the fun. The children become part of the show on and off the stage while bringing fun and energy to the show the way only children can do. We also offer Presto Paul’s Award Winning Close-Up Magic that is highly interactive – and serves as a great way to help your crowd mingle, should you be presenting a party or social event for your residents & guests. It’s a great solution for ice cream socials, garden tea parties, event dinners and special holiday gatherings. Presto Paul can offer a combination package of both strolling entertainment as well as a full stage style theatrical show. We would love the opportunity to learn more about your center and how we can bring Presto Paul’s Magic and Fun to your residents & guests. We offer several packages and can often work within your budget to ensure a successful program that will fit your needs, and create memories that last a lifetime! Contact us at 859-803-1655 TODAY to Book an Event or to discuss any questions you may have about our packages.